Mark Teixeira was invited to represent the United States in next Monday's Home Run Derby in Detroit, the day before the All-Star Game. I was half hoping he wouldn't be chosen -- the Home Run Derby seemed to throw Hank Blalock into a slump last summer. Blalock hit .303 with 23 home runs before the Break last year, and .240 with nine homers afterwards. You can argue whether there's any correlation, but I'd just assume avoid the issue a second time around. Did the Derby really affect his bat? I don’t recall Blalock claiming it did, so that probably provides the answer right there. Still, the cliff-drop in his performance after the break (especially the .166 decline in slugging) merits genuine concern. Armed with my strongest weapons, a spreadsheet and some free time, I have delved further into his mysterious second-half decay. The chart above displays a rolling OPS for Blalock in seven-game (green) and twenty-game (blue) spans. Blalock’s tremendous first half peaked on June 30th when he completed a five-game stretch that included four doubles and four homes. On the morning of July 1, he had an OPS of .977 for the season. Then, trouble began. 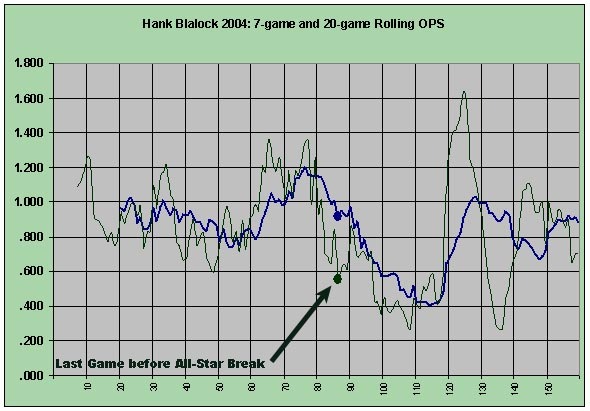 Slumps don’t have rigid requirements, of course, but Blalock arguably began his during the week before the All-Star game. On July 11, the last game before the break, Blalock’s oh-for-five gave him a .555 OPS over his last seven games, his lowest of the season in any seven-game span up to that date. He actually hit pretty well the week after the break, but in the 23 games from July 24 to August 16th, Blalock batted a sub-Mendoza .117/.244/.156. He then batted respectably over the season’s last seven weeks, if not at his earlier torrid pace. Blalock’s appearance in the Home Run Derby doesn’t appear to have harmed his offense, though it also certainly didn’t help. Having said that, I was guiltily relieved to see Teixeira’s lackluster performance in the 2005 Derby. He didn’t hit twenty awe-inspiring and potentially swing-altering homers. I expect Monday to be a non-issue in terms of his second-half output.